Ear Spray Music | Electro Acoustic Noise – Mark Pino, Ann O'Rourke, Carlos Jennings!! Synthesizing electronics, acoustic percussion, voice, electric cello and videos into dynamic and strange aural landscapes and improvisations. Live processed video and vocals. Layering lots of different sounds. Occasional very short periods of melody and playing in Western time. Band members – playing together since 2010!! See videos of all our gigs at https://www.youtube.com/user/annorourke12 , starting with the first one in August, 2010!! With the Big Screen for videos!! 24 hours of continuous live noize on the radio!! Our first time with electric cello! Our second time playing at this event. Ann will be recording video so everyone can see how she is making her strange cello sounds using styrofoam, threaded rods, thimbles, etc. Ann O’Rourke – vocals and electric cello Mark Pino – cymbal The first time we played as a duo. Our electronic musician, Carlos Jennings, was on vacation. Our third time playing at the 21st Annual Norcal Noisefest. The video does not show Mark, our Entertainer, rolling on the floor with his cymbal but you can hear him. Darn!! KZSU has an annual Day of Noise – 24 hours of straight of live improvised experimental / noise music. They host the event in our studios on Saturday, February 4th 2017, 0000-1159. This used to be an annual tradition at KZSU in the 90s. We’ve had a successful revival run the last couple of years and we’re going for the 15th annual event this year. Take a look at last year’s website and our archive of last year’s performances to get an idea. See the videos all our gigs at https://www.youtube.com/user/annorourke12 , starting with the first one in August, 2010!! October 13, 2016. Thursday from 8pm to 10 pm. Luggage Store Gallery in San Francisco. Very close to BART. 1007 Market St., San Francisco. Come and see the changes on this part of Market Street. Plus hear some great music!! May 19, 2016, Thursday at 9pm at the Stork Club in Oakland CA. Dive bar – lotsa fun. Mostly punk/rock/etc. They did’t throw tomatoes at us ;> http://www.storkcluboakland.com/ We had a great time. Our first time at a dive bar!!! SEE OBAMA AND TROUTMASTER REPLICA AT MINUTE 8:55!! Homelessness.One more evening of Post Beefheart weirdness!! Friday, January 15, at Berkeley Arts, starting at 7pm. This annual event’s theme is “Post-Beefheart”. In the Captain Beefheart tradition of being “out there” we made some changes – Carlos played bass and harmonica, Ann used images of The Captain’s art work mixed with her videos, and didn’t do any percussion which was very hard for her. Soon after the beginning there is about a minute that shows what her ipad video software looks like. Touchviz was developed by the same person as Touchosc, a popular midi controller. The muffled male voice in the background is The Captain, modified by Carlos. 8-16-15 Godwaffle Noise Pancakes in Oakland, CA, Noon to 2PM – Noisebridge Hacker Space in San Francisco, C7-25-15 Octopus Literary Salon, 2101 Webster St #170, Oakland, CA https://oaklandoctopus.org/ music!!! May 4, 2015 at 8 PM at the Spice Monkey Restaurant near downtown Oakland, CA www.spicemonkeyrestaurant.com . The series – Avant-Jazz & Experimental Noise Every Monday – Sponsored VAMP music art and consignment & Oakland Freedom Jazz Society Good parking, good food, good venue, and good food. There was a birthday party so we were quiet and they were loud. There were some kids there so I played science videos, which they loved!! Lotsa fun!! Ann’s videos are live processing of video samples – 100% improvised with the live music being played!! 7-26-15 at the Lab in San Francisco at BrutalSFX. Videos for all the groups with Bill Thibeault alternating on videos. May 23, 2015 Saturday, Ann O’Rourke is did processed video with Crows&Clouds at the festival. NextNow presents ALL TOMORROWS AFTER-PARTIES 2015 – their third benefit festival :: this is to benefit The Homeless Action Center…MAY 22-23-24 at Berkeley Arts Festival http://www.berkeleyartsfestival.com in Berkeley CA. – Videos for all the groups at Godwaffle Noise Pancakes 3-14-15 noon- 2pm at Noisebridge Hackerspace in San Francisco for all the bands.No video recording. To see videos of Ear Spray’s performances, go to www.youtube.com/annorourke12 !! All the way back to our first gig in August, 2010 at Skronkathon in Oakland, CA !! A few of them of had severe technical difficulties so we did not save the videos ;> I really miss those all-acoustic performances I used to do before I started using stuff that had to be plugged in. Drums and voice never failed to work!! 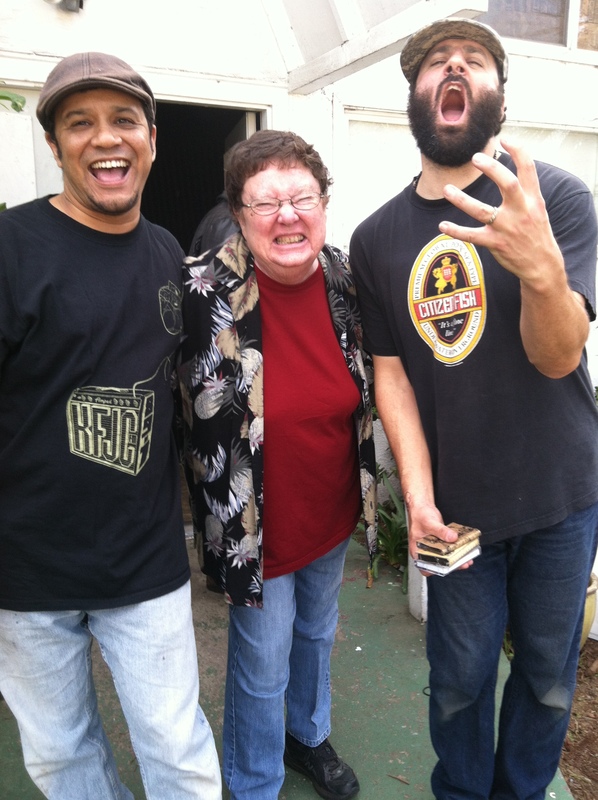 Ann, Mark, and Carlos after a recent Noise Gig at Live Changing Minstry in Oakland, CA!! 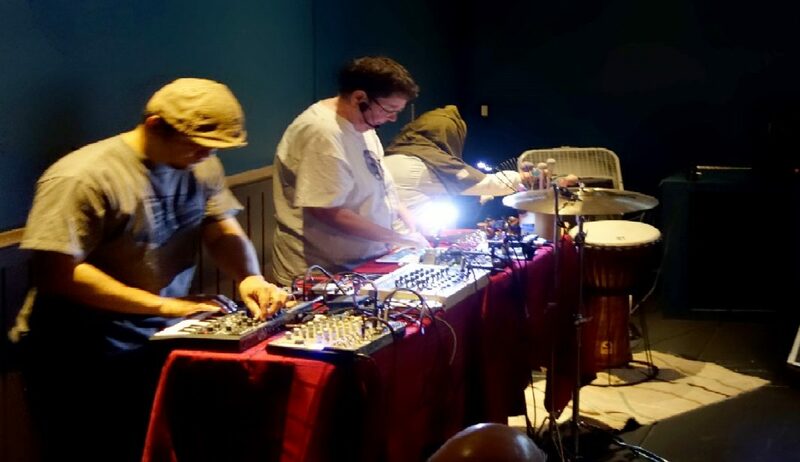 Ear Spray – synthesizing electronics, acoustic percussion, voice and videos into dynamic and strange aural landscapes and improvisations. Type of music: “Electroacoustic Noise” seems to fit the best. Electronic and acoustic instruments plus vocals (with sound processing) and videos (with lots of processing). Occasional very short periods of melody and playing in Western time. Layering lots of different sounds at the same time. Science videos with strange processing. Galaxies and nebulas, molecules, plants, blood and cancer cells, etc. Plus lots of effects, of course!! Ear Spray – the tinny sound that leaks out of someone else’s earphones. Ann O’Rourke and Mark Pino – electronicized cymbals and Nunnish large resonant metal plate, found objects, walls, furniture, etc. Ear Spray started 10 years ago when Carlos Jennings and Ann O’Rourke met at the Luggage Store Gallery’s (San Francisco, CA) weekly avant garde/experimental music series, run by Outsound Presents, happening every Thursday for over 20 years. Mark Pino joined the group in early 2013. The more percussionists the better!! They all know how to play as a group. No solos, no “stars”, just improvised music that is different every time they play. All three of them played many years in “rhythm sections” in rock and jazz groups. Carlos played bass and keyboards. 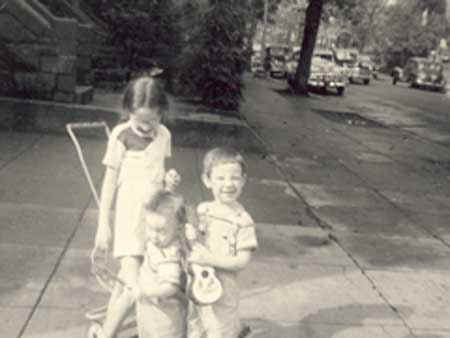 Ann and Mark played drumset. 1-6 PM at Winters Tavern 1522 Francisco Blvd Pacifica, CA. Home of Fog!! Located on the Pacific Ocean, west of San Francisco, with lotsa fog. It is part of a series of Fog Music events. We played in a bar with loud sounds from the bar patrons. I love the ambience!! We are playing Sunday October 5 at 2:30 p.m.
– Aaron Oppenheim – laptop. Not the usual drone. Very creative! – Rubber (() Cement – Very, very funny!! Upstaged all of us with his Big costume and leading the audience outside with him down University Ave.!! Aaron Oppenheim, an American-Canadian Canadian-American currently based in Oakland, who improvises sounds from his laptop. His music straddles the line between noise, drone, and glitch, always emphasizing liveness and in-the-momentishness. Rubber (() Cement – Realizes all tires as sentient animals covered in stamped hieroglyphs. The world is a reading surface-ribbon for any number of distributed microscopic eyes. Ear Spray – Synthesizing electronics, acoustic percussion, voice and videos into dynamic and strange aural landscapes and improvisations. Science videos with strange processing. Galaxies and nebulas, sharks, molecules, plants, blood and cancer cells, etc. Plus lots of effects, of course! !